The 2018 BMW X4 is a luxury compact SUV that seats five passengers. It competes with the Lincoln MKX, Mercedes-Benz MKC, and Audi Q5. Two trims are available: the xDrive28i and M40i. The X4 has a more coupe-like profile than its X3 sibling. The front-end retains the typical BMW styling cues, but the lower fascia is blatantly aggressive. Adaptive Xenon headlights, LED fog lights, power/heated side mirrors, power moonroof, and a power liftgate come standard. Adaptive suspension is also available. 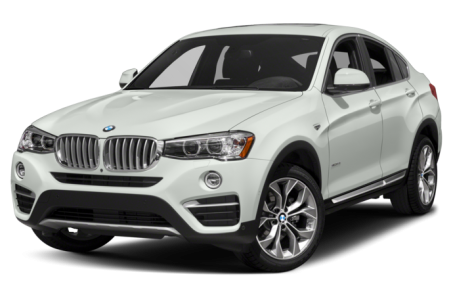 The X4 xDrive28i is powered by a standard 240-hp, turbocharged 2.0-liter 4-cylinder engine mated to an 8-speed automatic transmission and all-wheel drive. Powering the X4 M40i is the 355-hp, twin-turbocharged 3.0-liter 6-cylinder joined with the 8-speed automatic. Inside, the X4 has a premium leatherette/wood-trim interior with a 40/20/40-split folding rear seat. Maximum cargo capacity is 49.4 cubic feet with the rear seat folded down. The center stack features a standard audio system, which includes CD/MP3 playback, Bluetooth connectivity for phone and audio, and a USB port. It can be upgraded with navigation, a wireless smartphone charging station, a Wi-Fi hotspot, and a Harman Kardon surround-sound system. Standard features include automatic climate control, a leather-wrapped steering wheel, and an automatic dimming rearview mirror. Leather upholstery, a heated steering wheel, heated front and rear seats, and a heads-up display are optional. Standard safety features include adaptive cruise control, a backup camera, and rear parking sensors. Automatic parallel parking and a blindspot monitoring system are available as well.